The publication history of For the Further Improvement of Dancing, John Essex’s translation of Feuillet’s 1706 Recueil de contredances, is not entirely straightforward and raises some interesting questions. For the Further Improvement of Dancing is dated 1710 on its title page. The earliest advertisement I know is in the Tatler for 23-25 March 1710. A third edition was advertised in the Spectator (the successor publication to the Tatler) for 5 March 1712. I have not yet come across an advertisement for a second edition. Indeed, there is no explicit evidence for the successive editions in any of the surviving copies of this collection. The first edition was sold by the music publishers Walsh, Randall, Hare and Cullen, together with the author. According to the Spectator advertisement, the third edition was ‘to be had nowhere but at the Author’s House in Rood-lane, Fenchurch Street’. How should this be interpreted? Had Essex simply taken over the remaining copies printed in 1710 to sell himself as a ‘third’ edition? Or had he fallen out with the music publisher John Walsh, as others were to do later? There is just one copy of For the Further Improvement of Dancing which is indisputably a new edition, or, to be more precise, a reissue of the original edition in a different format with additional dances. Essex’s translation had originally been printed in the small, duodecimo format. This reissue is a much larger folio. 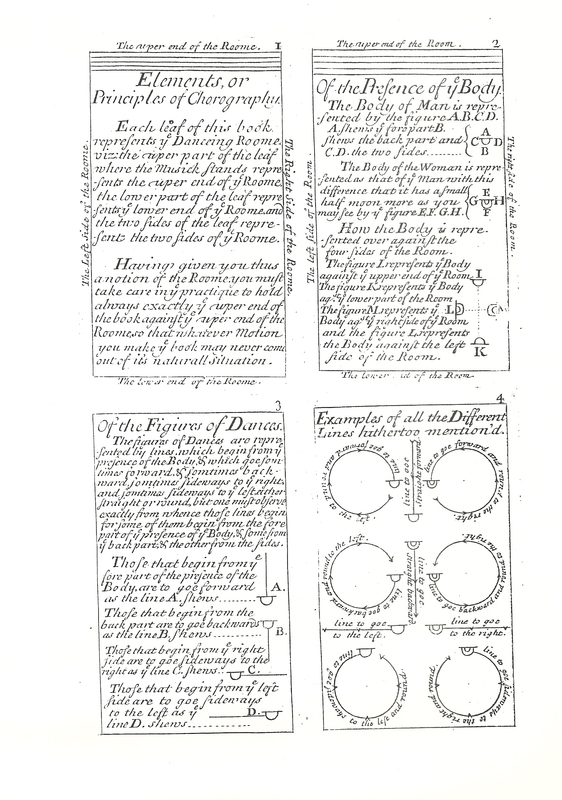 It uses the original plates (For the Further Improvement of Dancing is printed throughout from engraved copper or pewter plates), but these are placed four to a page. I will return to the titles of these in a subsequent post. The volume is dedicated to the ‘Princess of Wales’, dating it to after the Hanoverian accession on 1 August 1714. The Princess is Caroline, wife of George Augustus the son of King George I. Essex praises her ‘Patronage and Encouragement’ of the art of dancing and offers her the dances he has added to his original treatise. I suggest that The Princess’s Passpied was intended for performance by Caroline’s eldest daughter Anne, the Princess Royal aged around seven, who would be the dedicatee of several more notated ballroom dances. The sole surviving copy of this folio edition of For the Further Improvement of Dancing, now in the British Library, may well be a presentation copy made especially for Caroline, Princess of Wales. It is interesting to note that this unique copy, which has been dated to 1715, has an imprint claiming that it was to be sold by Walsh, Hare and ‘the Author’. By this time, John Essex was presumably well-known as a dancing master. 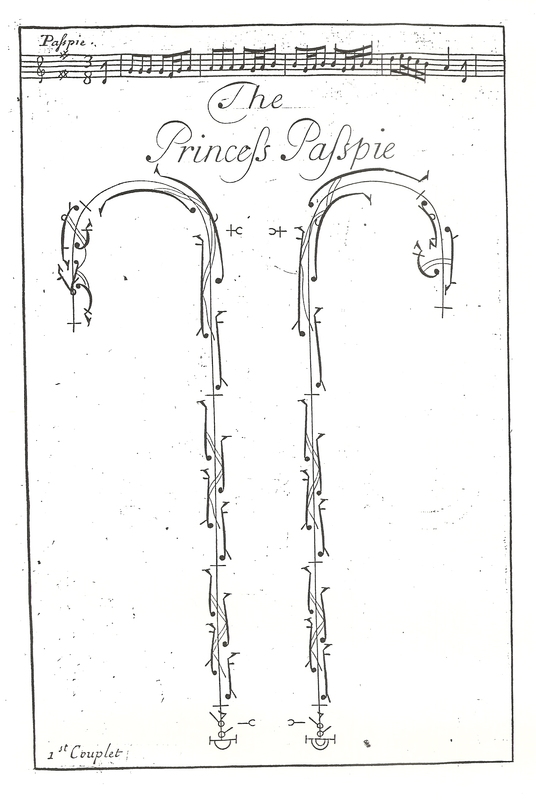 He was certainly careful to ensure that the title page specified that he ‘taught all the Ball Dances of the English and French Court’, probably meaning those that had been published in Beauchamp-Feuillet notation. The inclusion of The Princess’s Passpied would have underlined his expertise. Was he trying to recommend himself as dancing master to the new royal family? This entry was posted in Ballroom Dancing, Country Dancing, Dance Treatises & Notations, Dancers & Dancing Masters and tagged Baroque Dance, John Essex on December 28, 2015 by moiragoff.